Not a real ninja; we can see him. Go way back. Like way, way back; like to the 5th Century. A large region in the South-west part of Bengal was heavily immersed in warfare; the cool type of warfare with spears and swords, not the boring “cold” type. The land was conquered, pillaged, divided, conquered, re-conquered and finally re-united by two Buddhist conquerors (yes, there were Buddhist conquerors, too). Of course, they were peaceful men (read “Buddhists”) and hence could not keep the reign intact. The conquering and pillaging began again. This trend of breaking up and reuniting the kingdom continued all the way into 15th Century. From the Gupta till the Sen Dynasty a long slew of rulers ruled the kingdom including Bakhtiyar Khilji who also tried to spread Islam in the region. Of course he was killed a few years later and the man who actually managed to stop all the “Boom, pow, ka-boom!” was none other than Khan Jahan Ali (pbuh). Khan Jahan Ali (pbuh) was the general in the army of the Sultan of Delhi. In the 15th Century, Khan Jahan Ali accompanied by 12 of his followers, left his province to preach Islam in the South-West region of Bengal. During that time, Baro-bazaar (located in Jhenaidaha) was already booming financially. Rich merchants loved the place and it had become a centre for trade routes. So naturally, Khan Jahan Ali (pbuh) went over to Baro-bazaar and redecorated the entire city. Yes, he was rich and powerful. 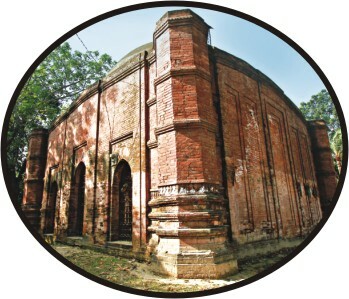 Like any leader trying to spread the practice of Islam, Khan Jahan Ali (pbuh) built numerous mosques all around the city. A collection of 12 such mosques were built in the 12 bazaars that were set up after the 12 followers. 12 became a lucky number in the region. The 12 mosques were very recently excavated in their demolished state, then renovated and opened to visitors. The three masters of Kungfu: The lazy, the happy and the acrobat. In a few of these mosques, there are pretty and informative displays of terracotta art. 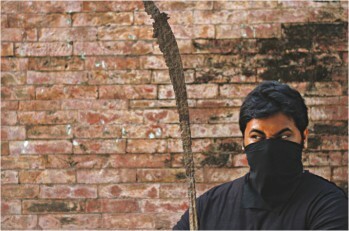 In one of them called the “Golakata” mosque, there is a four feet long sword that was used to chop off people's heads a long time ago. Well, in all fairness to the name, only criminals were killed there and this whole fact is also kind of just a rumour. But damn that sword is scary! Now here's what makes these mosques really mysterious. Some claim that the mosques came up from the ground by itself over night. We don't buy that but what we do buy is that when they were discovered by archaeologists, each and every mosque was destroyed, oddly enough, at the same approximate height. We're not sure how. A tornado? A typhoon? A mad monkey? Or a war when each mosque was systematically destroyed at the same level? Guess this one's going to remain a mystery. "LONESOME” George was the name given to the last surviving Pinta Island giant tortoise. George died on the 24th of June, 2012, at the ripe old age of 100 (give or take a few years). The reason he was called Lonesome is because he was the last of the species. Imagine that. Being the last of something. For 40 years George lived on Santa Cruz island, and in his last few summers, was widely known as the rarest animal on earth. As a conservation icon, he represented the loss of biodiversity all around the world. His species was largely killed off by humans for food or oil by whalers and seal hunters in the 1800s. The survivors were further exterminated, when their habitat was devastated by escaped goats. Yeah, goats. We are having a hard time figuring it out as well. There could still be relatives of old George on the neighbouring islands but it's highly unlikely, and his death could be the end of a sub-species - a lineage of ten million years. But the lengths to which the scientists went to get George a girlfriend was extraordinary. 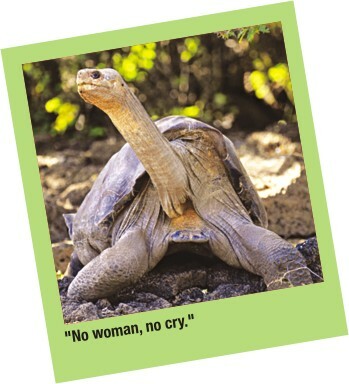 They tried brining in other giant tortoises of similar sub-species, they tried artificial insemination. The Government of Equador announced a $10,000 reward if someone could find him a mate. But the weirdest attempt was by a Swiss Zoology student, who smeared herself with female tortoise hormones and spent months trying to arouse the celibate George. All of them failed; yes, even the Swiss lady. It's unclear whether George just didn't know how to mate or whether he just didn't care. No matter what was done, George remained obstinately alone. George is now mourned, but his legacy lives on. His fame brought the Equador government to action and their conservation program is showing reward. 20,000 giant tortoises of different species live on in the Galapagos and most of the feral goats have been exterminated. The conservation effort would probably never have happened without him. He will be missed for financial reasons, too. He helped bring money spinning tourists in numbers over 150,000 per year. His body will probably be embalmed and left on display now, to make sure tourists can still glimpse the world's most famous tortoise. And sadly enough, on display, he shall be alone still. Goodbye, George. May you finally find a mate, even if only in the next life.